Edited by landscape architects and L.A. Forum Board Members Astrid Sykes and Christopher Torres, the latest issue of the L.A. Forum Newsletter explores the nature of public space, finding new definitions and dimensions through the prism of Los Angeles’s urbanism. In honor of its release, the L.A. Forum spoke with Sykes and Torres about the newsletter’s themes and their favorite semi-public places in the city. 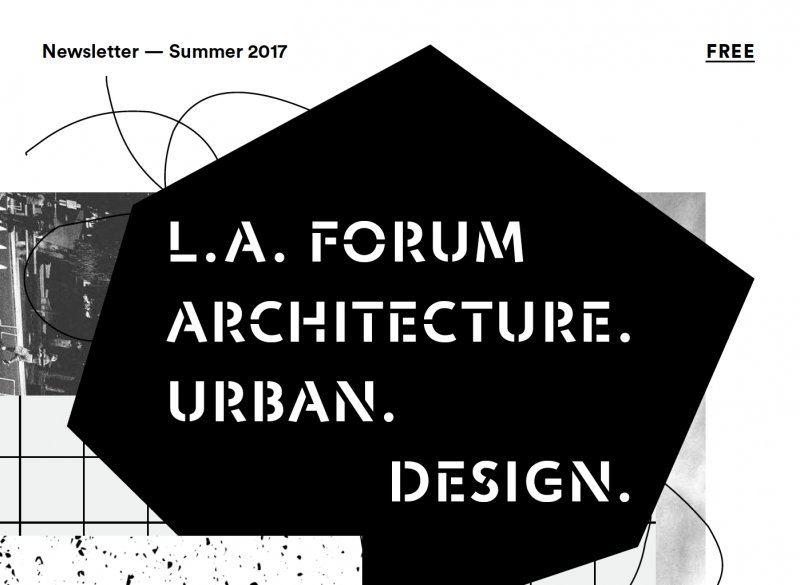 The focus of the Summer 2017 newsletter is public space in Los Angeles. How did you arrive on this theme? CT + AS: Since joining the LA Forum board in 2016, we have been wanting to curate a newsletter focused on public space. We both work in landscape architecture and urbanism practices and are fortunate to be part of some great public space projects in Los Angeles. With that work we have come to understand how sticky the term ‘public’ can be, and because of its complexity, how interesting it is to us. The very notion of a singular definition of public space is made void when examined through the lens of a city like Los Angeles that is defined by multiple publics, all connected or overlapping through the milleu of everyday life. Given the rising inclusion of public space in most design projects across the city, It’s clear that Angelinos are seeking moments for meaningful interaction and to live in a much more public way than past generations. In your editorial, you discuss a developing “trajectory of opening up spaces to become more public, more inclusive, and more democratic faces an uncertain future”. How did the current political situation affect your editorial approach? CT + AS: It was fascinating working on this issue through the 2016 presidential election. Many of our discussions to determine the newsletter’s direction were simultaneously playing out in the political arena. Questions such as ‘Who has a right to the city?,” “What is the role of public space in how we protest in a digital age?,” and locally, “Will Angelinos rise up and resist?” It was inspiring to be part of the demonstrations in downtown and LAX; seeing Angelinos quickly resist the regression threatening the public ideals we value. We believe in the importance of discourse on the state of public space, because without discussions such as those in this newsletter it becomes all too easy to take for granted what a special place in our society public space holds, both as a symbol of democracy and as a place that we all connect with on a personal level. Your editorial mentions that “public” space in Los Angeles is sometimes appropriated, semi-private space, a blurred boundary. What are some of your favorite semi-public spaces in the city? AS: I was lucky to be involved in the making of the Hauser + Wirth courtyard and garden – the use of this space by gallery visitors and the Arts District community was instantaneous and powerful. The gallery as a public paseo opens up an important conversation on the opportunities for alternative uses of interstitial spaces, and the importance of permeability in our changing city. I think Los Angeles museums are providing provocative outdoor spaces where one can experience new types of interactions. For example, LACMA’s campus has become a beloved, well-programmed park space with Burden’s Urban Lights and Heizer’s Levitated Mass creating collisions that inspire my work. CT: I’m interested in the semi-private vistas of the city, moments that remove you from the ground plane and provide a perspective of the region’s horizontal landscapes. Some of my favorite spots are the elevated walkways connecting the Bonaventure Hotel, the Home Depot rooftop parking deck in East Hollywood, and the Japanese Village Plaza parking garage roof in Little Tokyo. With the exception of the promontories of the Santa Monica Mountains and Baldwin Hills, there are few truly public moments to see the whole city; yet they are such a unique and necessary public experience for any city to have.